Considering recent events in the U.S. and all the celebrities who have passed away in 2016, some people might be very enthusiastic about the idea that the world is just an illusion, and that none of this is real. Earlier this year, Elon Musk made the news with his belief that we could all be living in a simulation. In fact, he went so far as to say, “There’s a one in billions chance we’re in base reality.” For all of us not as smart as Elon Musk, base reality is the name for the foundation reality, or the original state of existence. Basically, Elon Musk suggested we could be living in somebody else’s computer program – the Matrix is real, guys… and we might be in it. While The Matrix did receive an 87% fresh rating on Rotten Tomatoes, the idea of living in a simulated reality created by sentient machines still seems a bit far-fetched… or does it? A cat is sealed into a box with a vial of poison, a radioactive source, and a mechanism that smashes the vial if the decay of a radioactive particle is detected. The decay is completely random, so until you open the box you don’t know if the cat is alive or dead. In quantum theory, the cat is both alive and dead until the box is opened. It is only when the box is opened that the cat’s existence will collapse into a single state. We are radically oversimplifying this of course. If you want to understand the full picture, you might have to read a few books. Basically, our reality—as most people see it—does not permit something to be in two states simultaneously, but we are learning that they can. Likewise, our brains are capable of seeing a whole picture, but less trained to see the parts that make up that picture. So back to the pixilation. The idea of reality being indeterminate reminds many people of how television pictures pixilate when you get too close to the screen. Ever look closely and see those blue, green and red dots? There are spaces between those dots – but more on this in a moment. This shouldn’t take long, should it? Think of the simulations we ourselves create. With virtual reality and augmented reality, we are increasingly developing more realistic simulations. We can model the behaviour of animals, the swarming of bees, the movement of weather, and the evolution of entire galaxies. However, if you look very closely at these simulations, you can see the holes in them. Not everything follows the scientific laws we have come to count on. 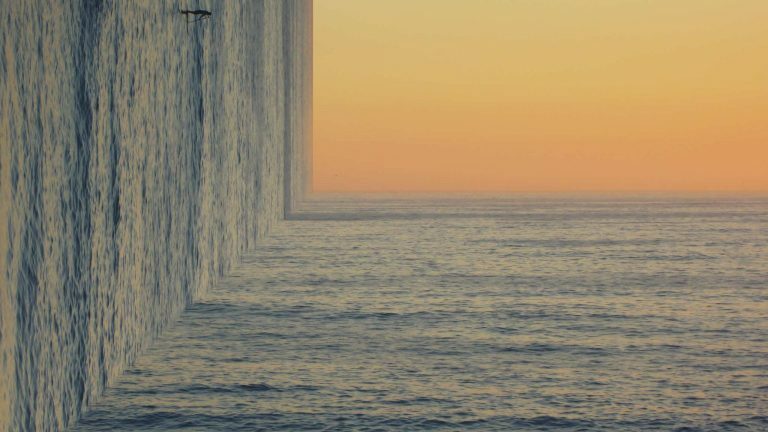 Like Wile E. Coyote hanging mid-air until he realizes there is no ground beneath him—there are gaps in our understanding, just as there are spaces between the pixels…The closer you look and try to understand the bigger picture, the further it falls apart. Is it so unbelievable that there might be a higher-level civilization that is just better at creating simulations than we are? Maybe we only see the “holes” in their simulation (our reality) when we look at the submicroscopic level—which is why we are only encountering these inconsistencies with quantum theory. Alternatively, we might not be in a simulated reality, we could be in a “real” reality that is being controlled by someone (or something) more advanced than us. Cosmologist Alan Guth of the Massachusetts Institute of Technology, sees some merit in this theory. He thinks our entire universe could possibly be an elaborate lab experiment. While the idea of reality being an illusion or simulation seems to have taken root in the public mind with The Matrix in 1999 (we won’t mention the sequels if you don’t), in reality (or fake reality depending on how convinced you are) this idea goes back further. We are not talking about an earlier movie…the concept goes back further than movies themselves. Just projections on a wall. Plato’s cave analogy. Almost 2,500 years ago, the ancient philosopher Plato from classical Greece had a thought. This thought has been called the allegory of the cave. He believed that people who didn’t understand the forms of how the world worked didn’t see actual reality, they saw instead, shadows of what was real. It was as if they were in a cave, and what they were seeing were shadows of the real things projected in front of them. Plato was not the only person who explored this philosophical idea. The philosopher Emmanuel Kant theorized that underlying what we perceived, was a “thing in itself” – a deeper reality that we could neither know nor understand. This thing underlies every part of the world we perceive. René Descartes battled with this idea also. He wondered if he himself was real, eventually coming up with his famous line, “I think therefore I am”. He believed that the proof of his existence was demonstrated by the very fact he contemplated his own existence. In the 1700s, the philosopher George Berkeley argued that the world was just an illusion. The English writer Samuel Johnson disputed the idea by kicking a rock, believing that his interaction with reality showed that it was not all an illusion. Or maybe just that it was a really good one. You might agree with Elon Musk, René Descartes, George Berkeley, Plato, and the creative team behind The Matrix. Or, you might agree with the people who think those people are all crazy. Whether or not reality is an illusion, we all have to live the reality we are in. And maybe we can take some comfort—if our world is a simulation, it might go a little further in offering an explanation for a Trump election or the popularity of Nickelback.